Pregnant? 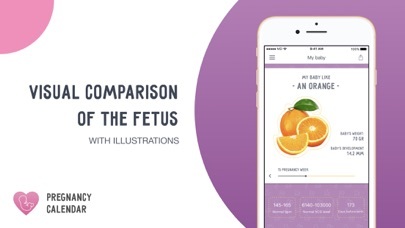 Get the free app for expectant to track how your baby grows. 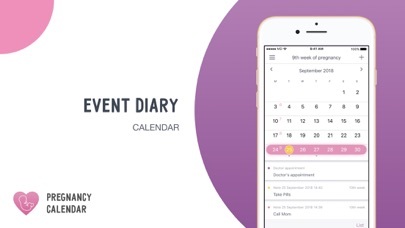 Pregnancy Calendar - is an indispensable tool for the expectant mother! 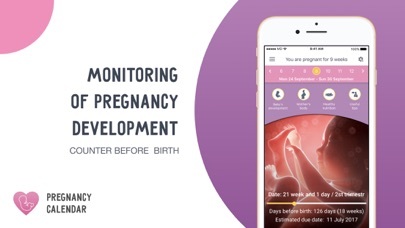 Get detailed information on the development of your baby at each week of pregnancy. Hundreds of thousands of women choose this application. Join us! 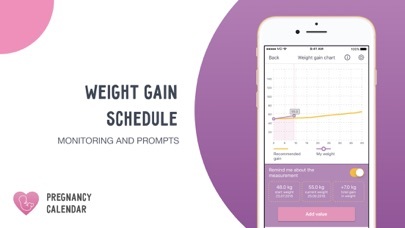 With Pregnancy Calendar you can easily: - Get DAILY pregnancy info - Track your pregnancy 9 months week by week - Get baby size information and development updates weekly - Get information on changes in your body flo - Manage weight and belly growth gain goals with clinical guidelines for your BMI - Track contractions and send results to a medic with Contraction Timer - Pregnancy+ Weight log - Track baby kicks with Kick Counter - Get more information about pregnancy by weeks - Share on Facebook, Email, Text & Twitter - Personal Diary - Pregnancy + week by week info and much more Every woman expecting a child prepares herself to give birth to her baby and, of course, she wants to know how her baby grows, what happens to the body and what other changes are waiting for her until the birth of the baby. 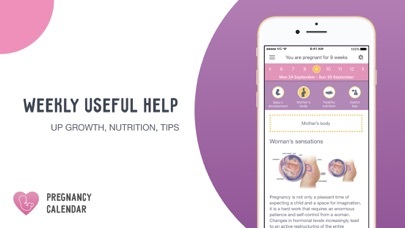 In this application, you’ll find the detailed weekly pregnancy calendar (Calendario de embarazo, semana a semana) giving easy access to information about the pregnancy and the baby development, changes in pregnant woman's body, as well as tips on nutrition for pregnant women. For each week of pregnancy, there are four pieces of information: •	Baby development, •	Mother’s body, •	Mom’s meals, •	Useful tips. To use the pregnancy calendar (Календарь Беременности) and to count your pregnancy due date just enter the day of your last period and you’ll see the information about your duration of gestation. This App is not intended for medical use, or to replace the advice of a trained medical doctor. If you have any concerns about your pregnancy, consult with your doctor or midwife. Lots of bugs (Beneficial Offers links to a screen in Russian! Anyway, what is a beneficial offer m?!) and errors (9 week ultrasound shows a caption of a fetus with 2 heads!) make this app frustrating and essentially a risk to use. The content about baby and mom’s bodies reads like a bot wrote it or it was translated using Google translate from another language. I couldn’t stand it. Off to find another app. It reads like it was written by a hard-headed male doctor, and the translation into English is mediocre at best. I didn’t care for the overall tone and the lack of acknowledgement that different women experience different symptoms at different times. But hey, maybe it’s just my “irritability and irrationality”. The app tells you nothing about the baby and has too many grammatical errors for my liking. 2 stars for not having cartoon looking fetus pics. Okay app, can tell it’s translated from another language, (Russian) and written from a very medical standpoint with medical jargon loosely thrown in. I have a nursing education though, so I know what the terms mean. There’s better pregnancy apps out there for sure though, so if I was needing the space on my phone, I wouldn’t keep it. Can’t stand the constant ads though, and I’m certainly not paying for the ad free version. It’s not even letting me change any of the dates I haven’t even got to set them because it only allows me like three months out of the year?!? You can tell that the text was written by a self righteous male. “The woman’s body” is not a phrase a woman would use. The tone angered me, but it was the oversimplification of pregnancy symptoms that just aren’t true for all women that really got to me. While it is true that pregnant women can experience these symptoms, that uncertainty and variability should be conveyed. This, in combination with the egregious and casual use of large medical terms in the middle of terribly constructed sentences makes the content more insulting than informative. Скачала и использовала много приложений на тему беременности, в том числе и полностью англоязычные. Нот лучше этого нет. Сейчас использую только его для получения информации понедельно, так как объема, который даётся тут вполне достаточно. Спасибо! Not all users are women...try having a mom/ dad/other selector. It’s an alright app. It does the basic needs of knowing what’s going on this week. I like that you can add notes to the calendar and see the size of the baby and stuff like that. However, I don’t like how it calls the weeks. For example I’m 28 weeks and some days so it classifies me as 29. It counts a week ahead. Also I was prescribed progesterone and I added that to the notes calendar but it took a couple tries to figure out how to do it and now I get like 4 notifications at different times a day. I tried deleting it and I thought I deleted all the ones I didn’t need but they still show up. So I tried deleting all of them and just start over but it won’t delete. It’ll edit it but delete it so now I’m stuck getting these annoying notifications at times I don’t need to be reminded. I’m considering deleting the app all together to get rid of it. Hi, so far I love this app- it’s simple, to the point and you can make notes in the calendar & see what is going on inside today. The only issue I find is that for example- I am 5 weeks & 3 days pregnant but the app keeps saying I’m in my 6th week of pregnancy and what is going on, but at the bottom area it give me the correct week & day. There is a glitch that needs some attn. One correct tracking and one incorrect. There is not a way to document multiples. Options in the settings are very limited. I'm new to the app but so far it's really easy to use. So far it seems to a really good app!!! User friendly and amazingly informative! I just got the app still playing around with it, will let you know. Won't let me change the due date. Muy buena la aplicación para seguir el embarazo. Useful and simple, without any unnecessary information. Прекрасное приложение! Смотрела много разных, в этом все как нужно! Реалистичные иллюстрации, много полезной инфы, контроль веса и роста живота, а в обновлении добавили счётчик схваток и шевелений!👍🏼 советую! Очень хорошее приложение для будущих мам. Много полезной информации, полезные функции: график набора веса (особенно после обновления, когда добавились граммы), график роста живота. Одним словом, скачивайте - не пожалеете!! !